This past Saturday, Logan's OT came over for our monthly visit (only two weeks late! Hey.. it's progress!) and we had a little chat while she and Logan were working. And that.. that's when the double edged sword came out of it's nice, safe sheath. Before I go on, a disclaimer. There are those this will not like this post. They will be offended and think my fears are completely asinine. There are those that will read it and think, "Lady, I have some seriously potent profanity just for you!" Respectfully, I will simply state that I know my Logan is not at all low functioning on the autism spectrum. I know, without one wisp of a shadow of doubt, that there are many, MANY parents out there that deal with things relating to autism spectrum, SPD, seizures, and allergies that are a hundred million times worse than Logan's worst days. Y'all are my heroes and my inspiration. And I learn from you every day. However, this is my blog, where I tell our family's story. As such, our story is what will be told today. I welcome anyone who would like the chance, to be a guest here to tell their own. Just email me. I'll be happy to discuss it with ya. Okay. On to the story. I was speaking with our OT about Logan. She mentioned his phenomenal progress (last year at this time he was just learning to sign, but not talking, was taking a few steps at a time,but mostly he scooted around on his bum and whimpered like a puppy when he needed something) and how soon he would be transitioning out of early intervention. And then... the sharp, cold blade of that double edged sword. I had mentioned that we would be taking a trip "Up North" to Primary Children's Hospital to have Logan officially diagnosed in early July, as we have to wait until he is 3. Also, we have to do it before the beginning of school next year so we can start the evil IEP process for him. She looked me dead in the eye and said, "Caryn you're going to have a hell of a time getting any kind of a spectrum diagnosis for him, even for very high functioning Asperger's." I must have looked shocked, because she went on to explain that while all the notes for his early intervention visits carefully document his repetitive behaviors, his echolalic tendencies, his meltdowns, seizures, frequent lack of focus and allergic reactions these people will not be seeing all that. They will only spend a few hours with him, and the chance of all that happening while he is there is slim to none. 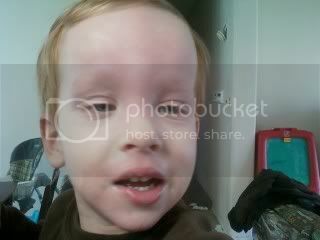 and even this, when the monsterlettes were only 5 days old, because Logan had a rough time getting here. He's the yellow one on the left. 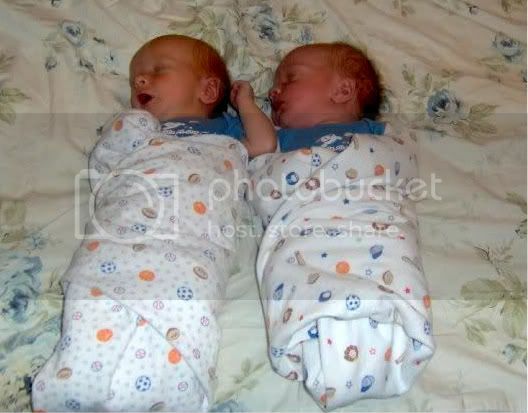 Colton is his twin, and he's the chubby red one on the right. Logan has made "too much progress".. yes, that's a direct quote. And that makes my heart hurt. What exactly does that mean- too much progress? I was really feeling sick when she left, so I called Bubbe. I was nine kinds of upset you see, and you know what she said? She said, "Look, just focus on the physical stuff. That's more than enough to get him support and services in school, what with the unexplained seizures and the sensory things, and the allergies." She's right. But still. Am I just supposed to "forget" about the meltdowns and the repetitive behaviors and the spinning and the hand flapping when he's upset? I don't know what to do, or think. And I hate it when that happens. 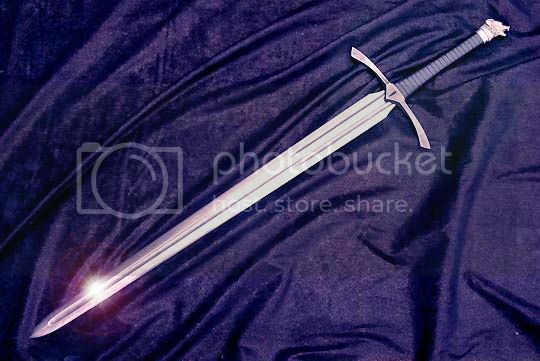 Double edged sword pic by photobucket, of COURSE! Anyone at all worth their salt looks at history, and asks parents questions about how they act at home, not just what they currently see in their office, when doing an autism evaluation. As bad as your EI people have been, I don't think I'd trust their opinion on anything. Just take the compliment of how much progress you've managed to help him make without their help, and forget about the rest. I understand your frustration. I wish I could help somehow, but I've seen how it goes in the school evaluations. We finally FINALLY got an official diagnosis and thought that we'd be able to have access to stuff. Know what they told us? "That's a medical diagnosis. It doesn't count." ARRRRGGGGHHHHH. Praying it works out a lot better in your state!! Keep us updated! We actually have a similar problem, although not as bad. We have lots of records and observations by assorted members of the school district that make it obvious he has a developmental delay, but no official diagnosis. The Special Ed teacher he has has assured us we would get a PDD-NOS diagnosis, but now I start to wonder because many of the behaviors have tapered off because of constant work. 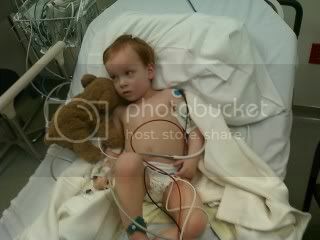 So I am scared now to go get a diagnosis and NOT be able to get one. ((hugs)) that is where we are right now. Regional Center at the start of this all said autism, he carried that all the way till right before he was about to enter kinder and SpEd said "ohhh he's fine, all those issues you see at home, nah we don't see them at all when he's at school. It must be a parenting problem"
That woman is lucky I didn't cut her in my home...then I would have a mess to clean up. Anyways stand strong and get what you need. Let me first say that I love your blog. Now I have 3 boys on the spectrum and one of the things I advocate for is families. Autism affect families in profoundly different ways. I commend you for sharing your story. Having been through this 3 times already let me tell you that an OT is NOT an expert in Autism nor can DIAGNOSE Autism spectrum disorder. When you go to a Children's Hospital for diagnosis they typically rely on their own findings. The things your OT was referring to, while true aren't the "red flags" the developmental neurologist will be looking for. Hand flapping is a HUGE red flag,spinning is a HUGE red flag, meltdowns are also very common as are repetitive ANYTHING. One of the fears I had with my kids during the diagnosis process is the consistency of their behavior. My youngest Emmett, is part of a major study into new intervention techniques. When they were testing him he was passing on something that I know shouldn't have. I pointed it out not because I want an Autism diagnosis but because I want an accurate diagnosis. I knew that if they did the test a few times they would get different answers each time. I guess my point is that I would ignore what the OT is saying as they simply DON'T diagnose Autism. It is a long journey to get a diagnosis BUT when you find a specialist that DOES they will look at the WHOLE picture. Again, speech delays, hand flapping, spinning and repetitive motions are ALL hallmarks of Autism. No one wants their child to be Autistic but the correct diagnosis opens up SO MANY doors that would otherwise be closed.